All trails at Heil Valley Ranch are open. With beautiful valleys, picturesque vistas, and forest meadows that seem to cling to the sky, Heil Valley Ranch offers a day’s adventure in the foothills. Main Trailhead can accommodate 56 cars and 4 horse trailers. Picture Rock Trailhead can accommodate 27 cars and 3 horse trailers. Several picnic tables located near the main trailhead. Large 50-person group shelter located near the main trailhead. A prescribed fire window is set at Heil Valley Ranch from Oct. 1 to Nov. 19 and the shelter cannot be reserved during that time. The shelter is available first come, first served during that time. Dogs are not allowed due to wildlife concerns. Conservation areas are closed to the public to protect critical wildlife habitat. Emergency access roads exist on the property. Visitors are urged to stay on designated trails since these roads do not always lead to trailheads. The Overland Loop and a new temporary parking lot opened on August 9, 2017. A permanent trailhead and two additional trails (the Schoolhouse Loop and east side trail) are currently being constructed. 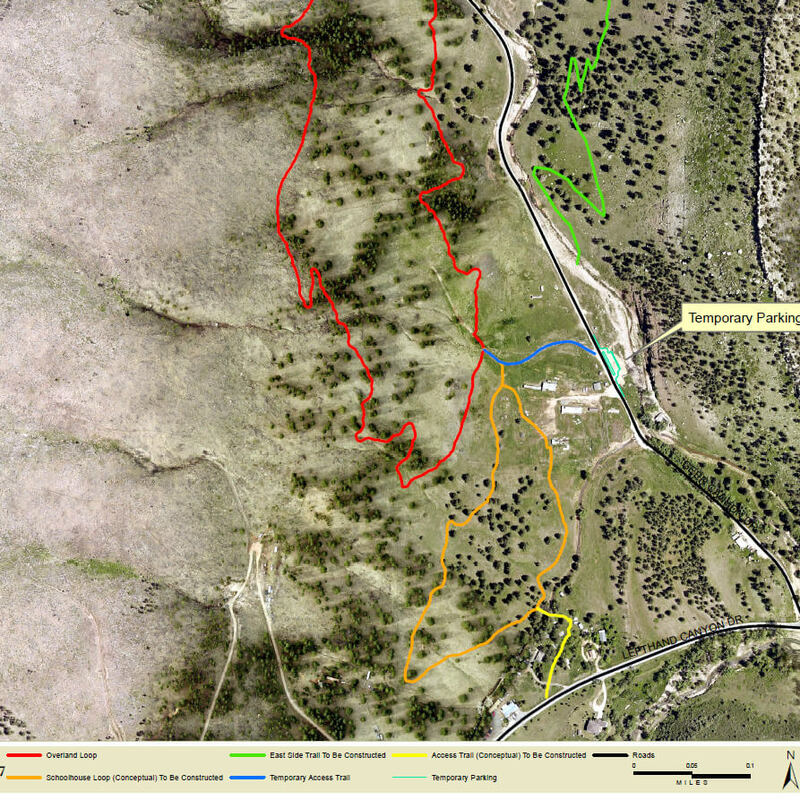 The permanent trailhead and Schoolhouse Loop could open as early as late 2018. The east side trail will open later in 2019. 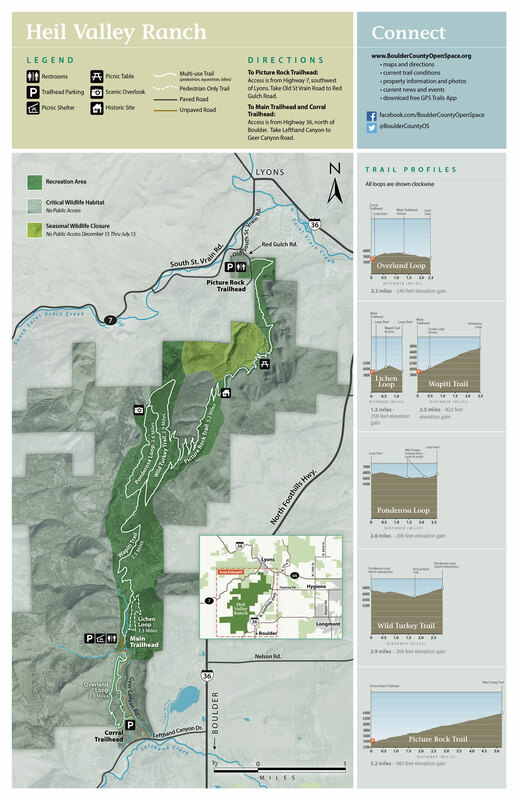 The new trails and trailhead are part of the Heil 2 Small Area Plan that was approved in 2016. The 6,231 acres of Heil Valley Ranch are home to over 50 species of mammals representing 70 percent of all the mammals found in Boulder County. Nearly 100 types of birds call this area home. Golden eagles and prairie falcons nest in the cliffs and canyons. The variety of wildlife found here is partly due to the diversity of vegetation. Much of the land is covered by ponderosa pine forest. Among the ponderosa pines, a variety of shrubs, grasses, and wildflowers thrive providing coverage for small mammals and food for deer. At Heil Valley Ranch you see the dramatic landscape where the Great Plains meet the Southern Rocky Mountains. The eastern-most ridge (hogback) at Heil Valley Ranch is capped by a rock layer called the Dakota Formation. On the west side of this property is another series of ridges that look red; this is the Lyons sandstone. This fine-grained sandstone, named after the town of Lyons, has been quarried locally and used for building throughout Boulder County. The Whitestone and Vickery Quarry Complex along the Picture Rock Trail operated from the 1890s to the 1960s. It was one of the more important quarry operations in the Lyons area. Lyons sandstone was mined there and can be seen in buildings on the University of Colorado campus. Four prehistoric sites (i.e. Native American sites used prior to contact with Anglo settlers) are on the property at Heil Valley Ranch. The first Anglo populations in the area were most likely beaver trappers exploring nearby rivers in the late eighteenth and early nineteenth centuries. One of the first Anglo females to reside in Boulder County was Nancy Phinox Geer, who settled here with her husband Solomon Geer in 1888. You may spot a few old stone buildings used by ranch hands, as well as a silo in a meadow up the Picture Rock trail. 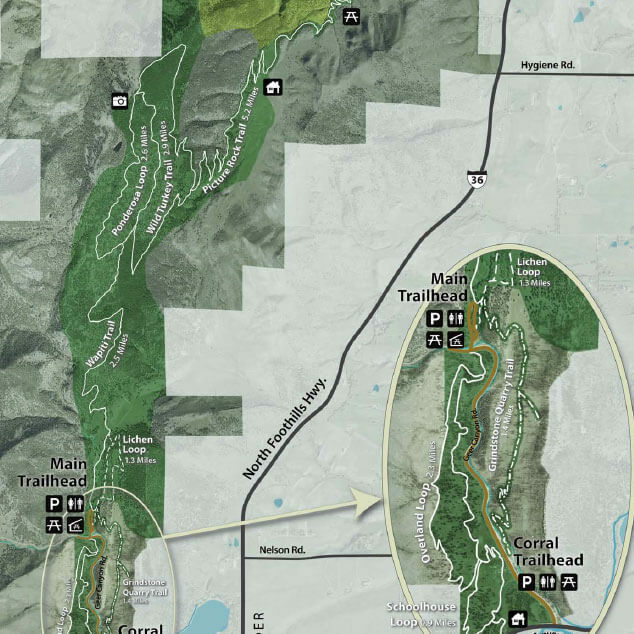 The majority of Heil Valley Ranch was purchased in 1993 and 1994 as part of the North Foothills Open Space that includes Hall Ranch and surrounding conservation easement properties.